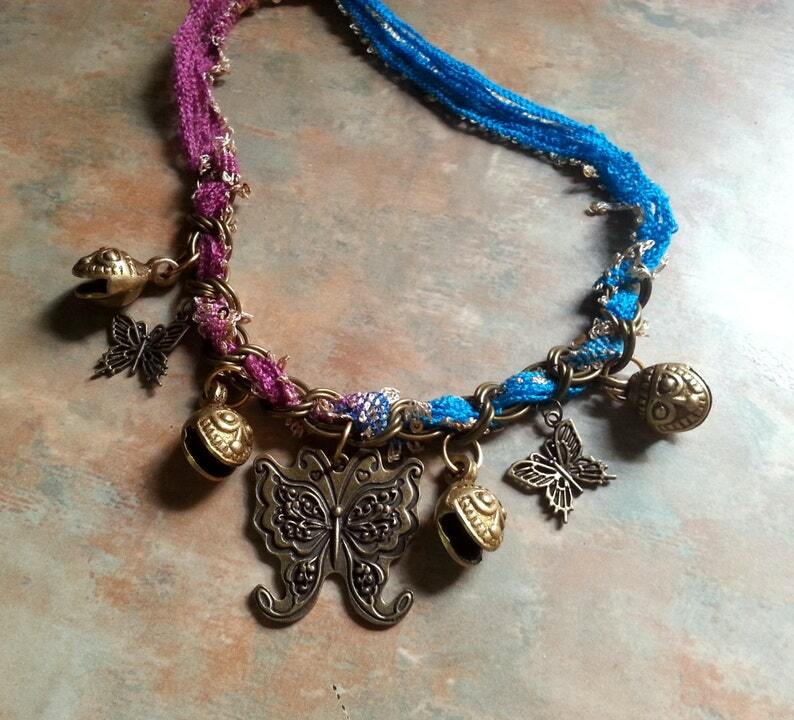 This unique bracelet/necklace was made using a antique bronze metal chain, in which I wove a multi colored gypsy-type material in graduating shades of pinkish-purple and turquoise..with shiny gold metal type threads running throughout. I then attached gorgeous antique bronze tribal bells, two small antique bronze butterfly charms and a large antique bronze large butterfly in the center. It can be worn as both a bracelet or necklace. It fastens with the ends of the material by tying. Perfect for your inner gypsy! These earrings are so lovely! I love the boho look and the quality of the earrings. The seller is wonderful and quickly responds. Highly recommend this shop! The color of this Fluorite Gemstone is beautiful. This is my third purchase from this store. I love this shop, every item so far has been just as advertised and customer service prompt and very friendly. I love the design of this bracelet and earrings. They are well made and were shipped quickly. I am a repeat customer and love the pretty fashion jewelry I find here. Could not ask for a better piece. Fast shipping also. I accept pay pal and direct checkout. Your item will be shipped to you within 2 days of cleared payment. If you are unhappy with your piece, I will accept it for exchange or refund within 15 days. If there is ever a problem with your item, please contact me as soon as possible and I will figure out a way to make things right. I ask you please not to leave negative feedback unless you have messaged me and I have not fixed the issue to your satisfaction. Your satisfaction is VERY important to me. I use usps. I ship either parcel post or priority. Let me know if you want confirmation or insurance on your item. I smudge every piece before I send it to you for purification and blessings. I am very happy to do custom orders! I actually love creating a piece especially for someone. Unless otherwise specified, I do not use sterling silver or real gold. It's very expensive and would increase my prices considerably. I make costume jewelry. I do my best to turn out good, well made pieces. If you want something done in a precious metal or with precious gems, you must notify me in advance as a custom order. I will also require payment for the materials up front.